Recently, the Manager Zhang of domestic market center of SBM Machinery received a phone call which from a Hunan client. The client told that the product he bought was not the same with SBM Machinery Chinese master website ( http://www.shibangchina.com/ ). Through various ways verification, our company final affirmed that the client from Hunan was used and tricked by lawbreaker. Introduced by the Hunan client, he was informed from a friend that the using effect of SBM Machinery's mining product is excellent. So, the client decided to purchase the series crushing products of SBM Machinery. Through many ways inquiry, the client came into contact with a person who named Li Hongjun and even claimed he was the principal of SBM Machinery agent. 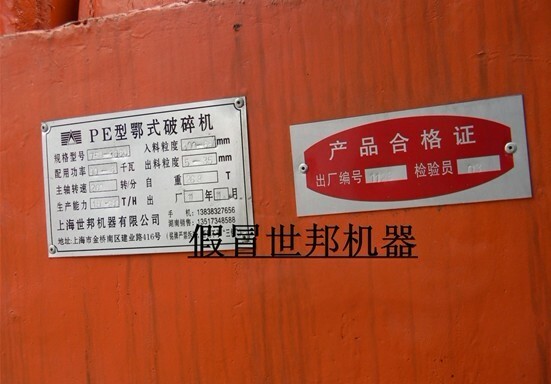 Under the situation that Li Hongjun repeatedly guaranteed he was the agent of SBM Machinery, starting from the confidence and trust for the quality of our company, the client signed a contract soon with the cheater, Li Hongjun, and payed the payment for these goods. The Hunan client didn't find he was tricked until these products came to his hands. At present, under the assistance of SBM Machinery, the cheater Li Hongjun has been detained by Public Security Office, the thing waiting him is severely legal punishment. 1. SBM Machinery uses the direct sales way and never found any agent in nationwide. 2. Consulting the condition of our mining products, clients could directly log in the SBM Machinery Chinese master website ( http://www.shibangchina.com/), or call the nationwide unified sales hotline : 400-696-1899 and 021-58386699. As the leader of high-end mining equipment manufacturing industry, SBM Machinery reminds our extensive client friends, please through the regular ways to make arrangements with us, raising your vigilance and bewaring of cheated.